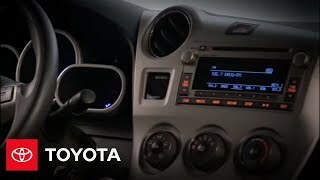 The versatile and sporty Toyota Matrix, which received a significant refresh for 2011, moves into 2012 continuing with two model grades and two powertrain offerings and available all-wheel drive. The five-door Toyota Matrix deftly combines a fun-to-drive spirit with the utility of a small SUV and excellent fuel economy. 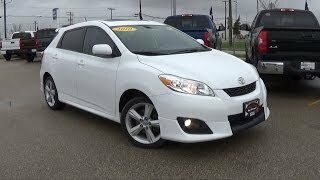 The 2012 Toyota Matrix continues to feature the standard Toyota Star Safety System™, which includes Vehicle Stability Control (VSC), Traction Control (TRAC), an Anti-lock Braking System (ABS), Electronic Brake-force Distribution (EBD) and Brake Assist. It also includes a Smart Stop Technology brake-override system. 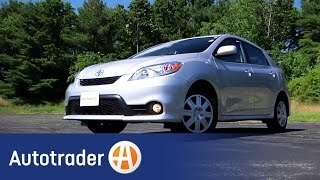 The versatile and sporty Toyota Matrix, which received a significant refresh for 2011, moves into 2012 continuing with two model grades and two powertrain offerings and available all-wheel drive. All Matrix models also include the Toyota Care complimentary maintenance plan, which covers the car for two years or 25,000 miles, whichever comes first. 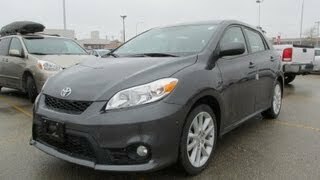 The five-door Toyota Matrix deftly combines a fun-to-drive spirit with the utility of a small SUV and excellent fuel economy. The 2012 Matrix continues to feature the standard Toyota Star Safety System™, which includes Vehicle Stability Control (VSC), Traction Control (TRAC), an Anti-lock Braking System (ABS), Electronic Brake-force Distribution (EBD) and Brake Assist. It also includes a Smart Stop Technology brake-override system. 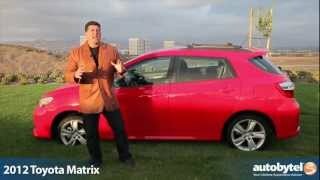 The 2012 Matrix is available in two grades: base Matrix and the sporty S grade. Powertrain choices include 1.8-liter and 2.4-liter four-cylinder engines, a five-speed manual transmission, and either four- or five-speed automatic transmissions. The all-wheel-drive (AWD) Matrix S is equipped with the 2.4-liter four-cylinder engine and the ECT four-speed automatic transmission. The Matrix grade is powered by a 1.8-liter DOHC four-cylinder engine, which produces 132 hp at 6,000 rpm and 128 lb.-ft. of torque at 4,400 rpm. Dual Variable Valve Timing with intelligence (VVT-i) controls valve timing on both the intake and exhaust camshafts to help optimize performance and economy. The 1.8-liter engine is paired with a five-speed manual transmission or a four-speed Electronically Controlled automatic Transmission (ECT). The Matrix S exclusively features a 2.4-liter four-cylinder engine that produces 158 hp at 6,000 rpm and 162 lb-ft of torque at 4,000 rpm. A balance shaft suppresses vibration, and the exhaust system is engineered for reduced backpressure for improved performance. This engine teams to a five-speed manual transmission or a five-speed automatic (four-speed with AWD). The Matrix grade has earned an EPA-estimated fuel economy rating of 26 mpg city and 32 mpg highway for the 1.8-liter with the five-speed manual transmission, and 25 mpg city and 32 mpg highway for the 1.8-liter paired with the four-speed automatic transmission. The Matrix S powered by the 2.4-liter engine with five-speed manual transmission achieves an EPA-estimated fuel economy of 21 mpg city and 28 mpg highway. With the five speed automatic transmission, it earns 21 mpg city and 29 mpg highway. The Matrix S AWD with the four-speed automatic is rated by the EPA at 20 mpg city and 26 mpg highway. In addition to the Star Safety System, Matrix incorporates a comprehensive list of safety features. Featuring front and rear crumple zones, the Matrix is designed to efficiently absorb and disperse impact energy throughout the body structure. Deformation of the passenger cabin is well managed due to the impact-energy-distribution design and high-strength steel used in the body. Generous standard equipment on the Matrix grade includes an all-weather package; power windows with driver’s side auto down and retained power features; power door locks; cruise control; color-keyed power heated outside rearview mirrors; tilt and telescopic sport steering wheel; daytime running lights; heavy duty rear window defogger; AM/FM/CD audio with four speakers with MP3/WMA playback capability, auxiliary audio jack, and auto sound leveling (ASL); intermittent rear window wiper; 12-volt power outlet; front center-console box; and an engine immobilizer. The Matrix S grade also adds metallic interior trim; a 115-volt power outlet; integrated fog lamps; fold-flat front passenger seat; remote keyless entry; AM/FM/CD with MP3/WMA playback capability and six speakers. Available options on the Matrix grade include a base Sport package with front and rear underbody spoilers, integrated fog lamps, with a unique S badge. Seventeen-inch, five-spoke alloy wheels with 215/45R17 tires. The Matrix S offers an S Sport Package with 17-inch alloy wheels, front and rear underbody spoilers, color keyed rear spoiler and a unique S badge. The Premium Package offers a power tilt/slide moonroof with sliding sunshade, AM/FM CD player with MP3/WMA playback capability, six speakers, XM® radio (includes 90-day trial subscription), auxiliary audio jack, USB port with iPod® connectivity, CD text display function, auto sound leveling and hands-free phone capability and music streaming via Bluetooth® wireless technology. The second-generation Matrix displays sport-coupe-inspired styling cues while maintaining impressive interior utility. The result is a sporty, dynamic shape that provides a quiet interior for five people to ride in comfort. The Matrix has rounded rear windows and continuous character lines that run from the front grille to the A-pillar. The Matrix S integrates front and rear underbody spoilers and a large mesh front fog lamp bezel. Cockpit styling in the Matrix is anchored by a driver-oriented instrument panel and console controls. The Optitron instrument-panel gauges feature bright white lighting and new silver ornamentation, with a large round speedometer mounted in the center and a tachometer to its left. A combination gauge to the right of the speedometer houses a fuel level indicator, an engine temperature indicator, and an LCD display that combines an outside temp indicator and odometer/trip meter. The center console features metal-plated rings around the air conditioning vents. A choice between two interior color schemes includes dark charcoal or a combination of dark charcoal and ash gray, and a three-spoke steering wheel adds a sporty touch. Matrix S comes with a leather-trimmed steering wheel that includes spoke-mounted audio controls and hands-free Bluetooth capability. The front center console features a movable and removable cup support element. The cup holder area can be used as a tray when the divider is removed, and all open trays have rubber mats. Multiple storage spaces are located throughout the interior, including front and rear door pockets that each holds a 20-ounce plastic bottle. Four side panel shopping bag hooks and four D-rings in the floor provide luggage tie-down convenience. A cargo area folding tonneau cover also comes standard.